You’ve been brushing and flossing your teeth for years now (hopefully)! After so long, your dental hygiene routine can become just that—routine. Each morning your brush and floss your teeth becomes more numbing and rushed. You’ve noticed that you don’t pay attention to the point of caring for your teeth at home: to effectively remove harmful debris, bacteria, and plaque from your teeth and gums. Your dentist in Ft. Collins wants to help revitalize your brushing and flossing routine. These tips will hopefully refocus your attention on maintaining healthy teeth and gums rather than rushing through your dental routine. 1. Brushing your teeth should not make your gums bleed. The point of your at-home dental routine is to avoid tartar build up and tooth decay by removing as much plaque as possible from your teeth. You don’t have to do this roughly, be gentle to your teeth and gums! Brushing too hard can cause damage to your enamel or inflammation around your teeth. Many patients think that it’s normal to bleed—even just a little—while you brush and floss. That’s a red flag (literally)! You may have a dental issue forming or your gums could be telling you that you need to ease up on the scrubbing. Brushing should be like a massage for your gums and teeth, not harmful. 2. Always use a new, soft toothbrush. You may think that you need a stiffer brush to effectively clean your mouth. But, not all toothbrushes clean your teeth thoroughly just because they’re rougher. 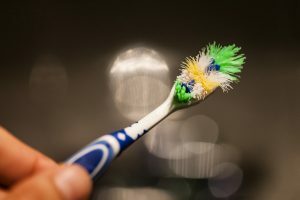 Your toothbrush should be created with soft bristles. Soft bristles are more flexible to reach into the crevices of your teeth and still be gentle on your gums. Whenever you notice your toothbrush is wearing or it’s been about 3 months, replace it with a new one. Replacing your toothbrush alone can help make you feel refreshed about your dental routine. 3. Tell yourself flossing is fun. Flossing isn’t typically something that most patients look forward to, but you shouldn’t consider it to be a chore either. Dr. Lindsey knows that it takes time and effort to remove plaque between each and every tooth. Nevertheless, flossing is a very important part of preventive dental care! When you start flossing, be committed to reaching between each tooth—even in hard to reach places—to avoid gum disease in the future. Flossing simply once a day can also reduce the time your dentist must scrape hardened tartar from between your teeth during your dental appointment. If it’s hard for you to adjust to flossing effectively, there are many tools that can make flossing easier and more enjoyable. Brushing twice a day and flossing helps to remove food particles, dental plaque, and harmful bacteria from your mouth. Another great way to prevent dental problems is by visiting Dr. Lindsey at Aspen Dental Care to receive professional cleanings regularly. Maintaining great oral health takes a team. Both you and your dentist have to do their part to keep your teeth and gums strong. Contact us today to schedule your next dental cleaning and checkup.